What makes a great playing partner? Golf is hard enough without having to deal with a difficult playing partner. What are the key attributes that make for the perfect companion on the fairways? 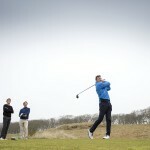 Golf is predominantly a solo sport, a personal battle against the course and the elements. There are many and varied challenges to be faced on the links, from controlling ball flight to controlling inner-demons. Most golfers would argue there are few, if any, sports that provide such a complete examination of an individual’s mental fortitude and physical dexterity. But, although the golfer is largely in control of their on-course destiny, they will always have company in competitive circumstances. To succeed in scaling their personal golfing mountain, the intrepid golfer needs a solid team of playing partners who encourage rather than irritate, display positivity rather than despondency. We’ve all experienced both ends of the spectrum – playing partners who have buoyed us and spurred us to success, others who have infuriated us to a point of capitulation. So what makes for a great playing partner? What are the virtues we look for in a companion on the fairways, and what are the most annoying characteristics one can display? And remember when reading this; do unto others as you would have done unto you! A fundamental attribute in a good playing partner is time-sensitivity. Their golfing ability is largely incidental if they’re conscious of the necessity to keep up with the group in front rather than just ahead of the group behind. There is nothing more distracting in competitive golf than feeling your group is flagging, and that only you are aware of the predicament. You become anxious and tight, you speed up your pre-shot routine and hurry to your ball, grinding your teeth as you watch your partner sauntering along, taking an eon to select a club and an eternity to make a swing. A good playing partner will be ready to play when it’s their turn, they will play a provisional ball if there’s any doubt as to their original’s whereabouts, they will be quick to abandon a search if it’s clear the ball is gone or if there’d be no advantage in finding it. If you’re going to lose it, lose it quickly. Although it’s not a player’s ability that makes them a good partner, it is pleasant to watch someone who has a nice rhythm and plays a sensible game. It can be useful to partner someone who is a little better than you, to watch how they construct a score and perhaps feel you’re learning a little while you’re out there. All golfers are constantly learning, whether it’s regards physical or mental approach. A great playing partner will have a level of interest in what you’re doing on course. For a start they’ll watch your ball. If visibility is tricky they’ll concentrate as you drive off, and if your ball strays off line they’ll watch it down. Then, if they’re marking your card, they will count how many shots you’re taking. They won’t ask at the conclusion of every hole, “how many there?” Nor will they make you say your score out loud when you’ve just hit two out of bounds and racked up an eight. If their score has gone west with no hope of redemption and yours is still intact, they’ll shift their allegiances towards your efforts; paying extra attention to where your ball goes and maybe even offering some carefully chosen, and well-timed, words of encouragement. There are some people, though, who just can’t help but say the wrong thing at the wrong time on the golf course. Even if they’re trying to be helpful, it just seems they’re testing you mentally. The sensitive playing partner will, for instance, not comment on how straight your driving has been just as you prepare to tee it up on the narrowest hole on the course. Nor will they give you that sage piece of advice; “Take your time!” as you prepare to finish off what you’d previously believed to be a mere tap-in. The thoughtful playing partner will be interested enough in you as a person to find out a little about you on the way round. They won’t pry, maybe just enquire what other sports you like or ask if you watch Masterchef: Just enough to create a relaxed environment. They won’t talk at you incessantly about their lives, or burden you with their problems. There’s quite enough to be stressed about on the fairways without hearing of your playing partner’s divorce proceedings. Through tougher times they’ll empathise without being patronising, they might even be able to lighten your mood with a few soothing words. They’ll play smoothly and at a sensible pace, they’ll know when to speak and when to keep shtum. They might not be a friend off the course, but if they’re your perfect match on the fairways, a great playing partner is to be appreciated and respected.